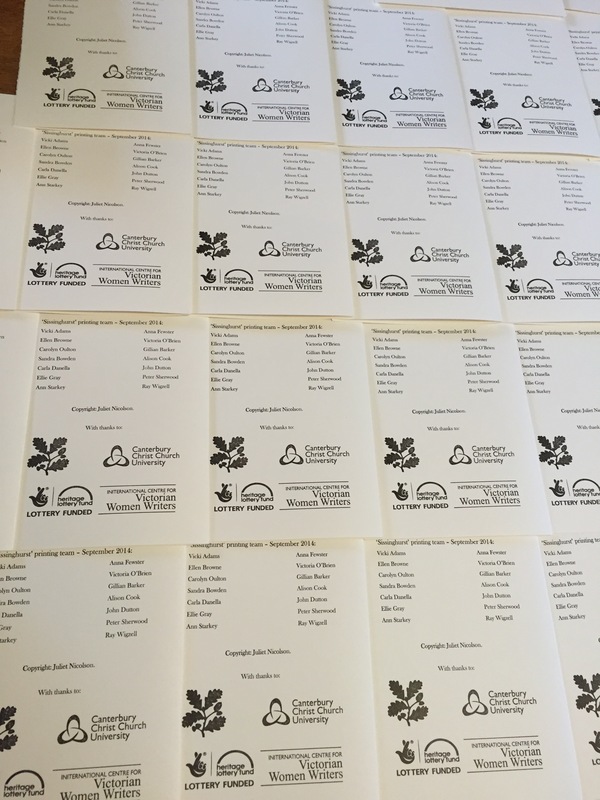 Letterpress Reimagined – Sissinghurst Castle | A Heritage Lottery Funded project to reprint a poem by Vita Sackville-West, using traditional letterpress technology. 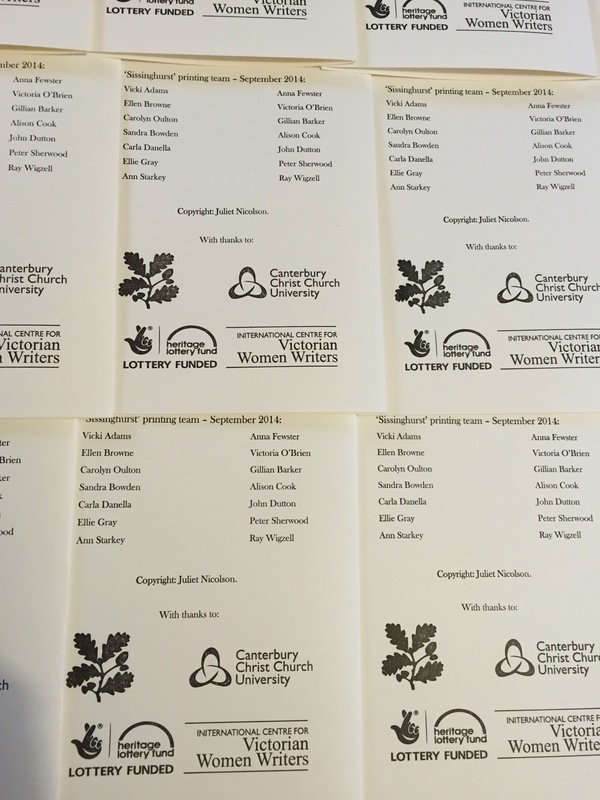 A Heritage Lottery Funded project to reprint a poem by Vita Sackville-West, using traditional letterpress technology. 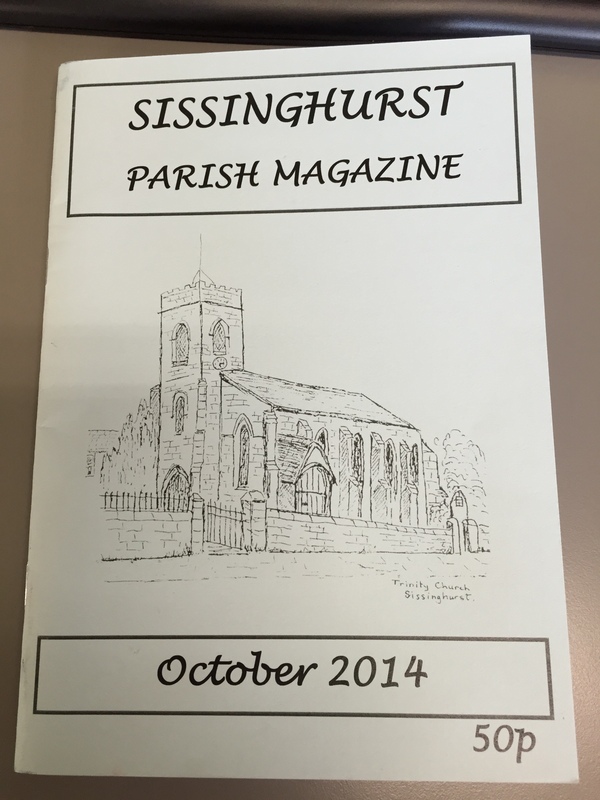 ‘Sissinghurst’ by Vita Sackville-West – Available now. The launch of our Letterpress Reimagined project went really well this Wednesday. 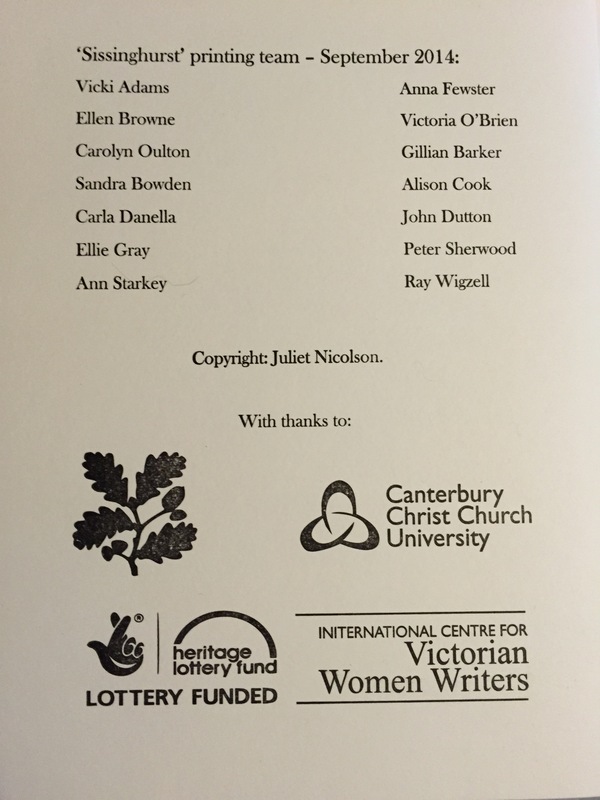 I’ll write more about the symposium shortly, but I wanted to say that the poem booklets can be bought from Sissinghurst Castle by telephoning them on 01580 710700 (choose option 3). The suggested donation is £10. Here they are, looking lovely! Part of our brief for the Letterpress Reimagined Project has been to share experiences and stories from those who have had careers in the printing trade. Often, we only get to hear about these experiences if we sit down and talk to someone, or if they come from a member of our family. We felt it was important that these kind of stories find a wider audience – that these skills and experiences are not lost in our increasingly fast-paced, hi-tech society. 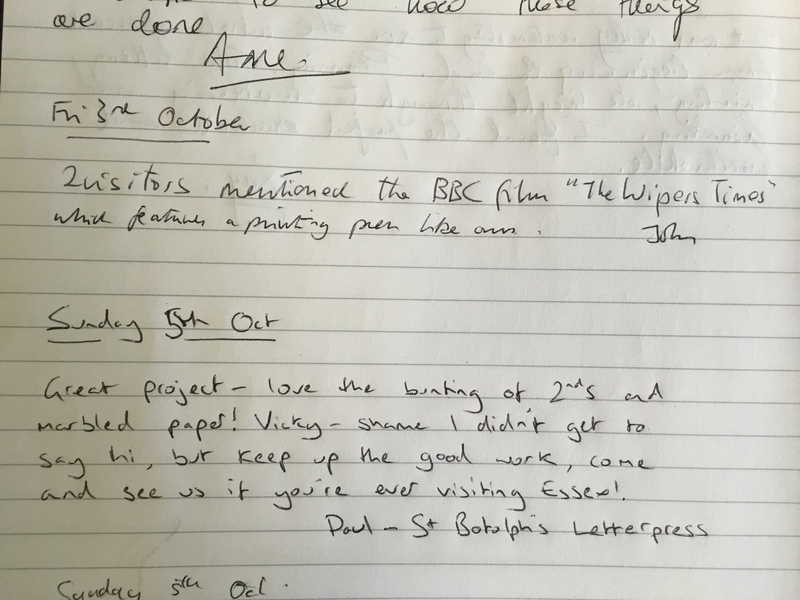 Over the next few days, as we prepare for the Letterpress Reimagined concluding symposium, we’re going to be sharing some of those stories – a couple of these are from our trip to the Print Workshop at Amberley Museum, one comes from conversations held during the project exhibition, and today’s comes from someone who’s been an incredible help to the project as a whole. Today, we battled wind and storm to meet, to gather our printed poem pages, and to add some finishing touches to the rear page of the poem booklet. The event is from 1-3pm, and will include talks from Vicki Adams (Letterpress Reimagined), Dr Andrew Palmer (Canterbury Christ Church University) as well as from volunteers involved in the project. Copies of the finished poem booklet will also be available! Feel free to drop us a line if you have any questions about the event. 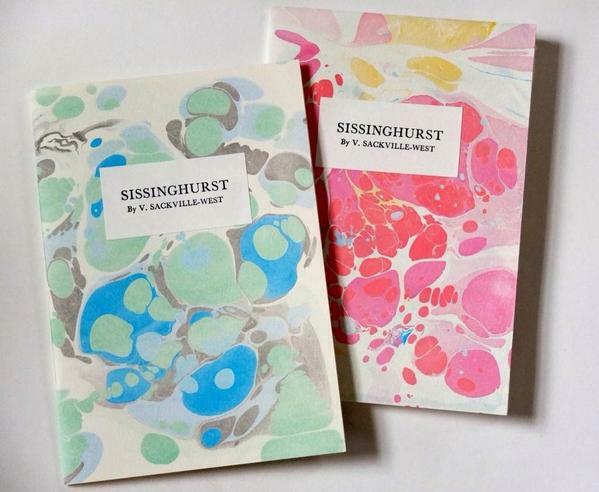 You can email us at vicki@letterpressreimagined.com, or call the Sissinghurst Castle events office on 01580 710700. That was a corny joke, forgive me. 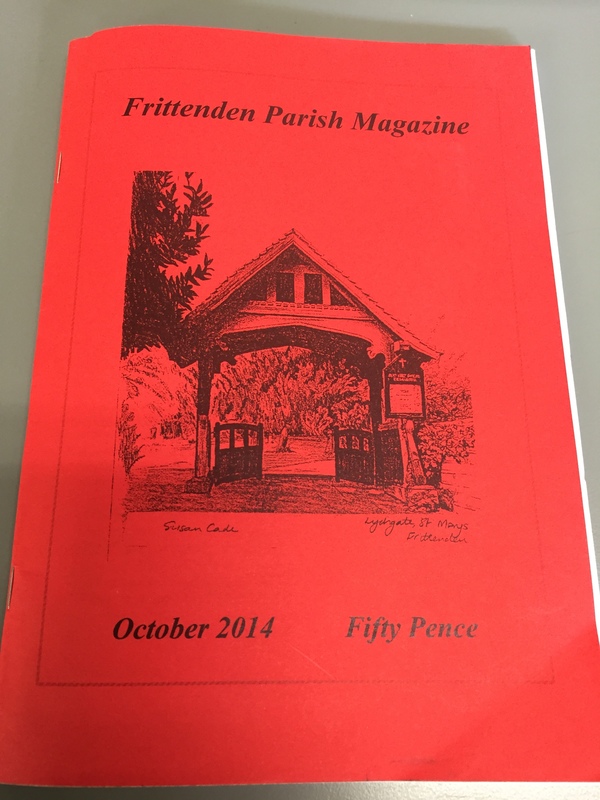 We are very proud to have made some of the local Parish magazines for the Sissinghurst and Frittenden parishes, thanks to the excellent pennings of one of our volunteer team, John. It’s all well and good doing a project like this, but I feel is important that the project reaches the local communities around it, rather than just staying within the four (or so) walls of one locality. 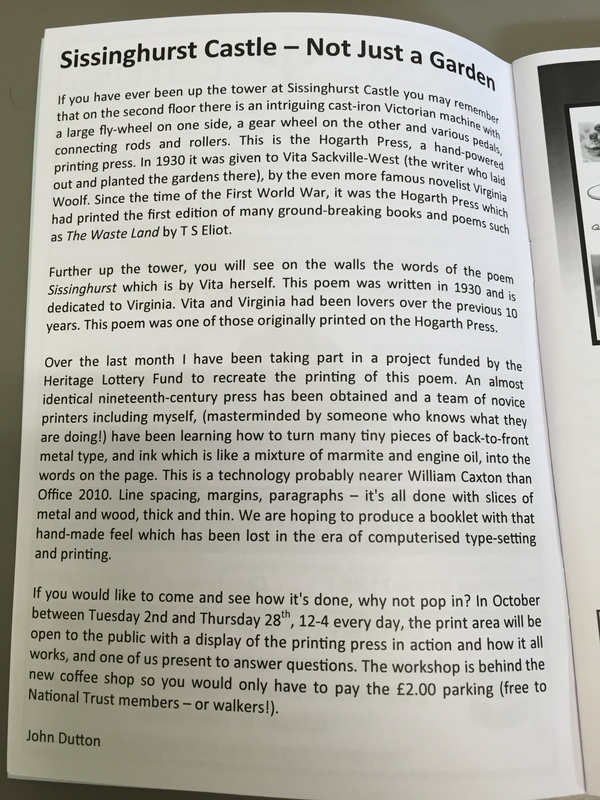 We’ve already had a couple of conversations from residents from these villages who have read the pieces and come along to see what Letterpress Reimagined is all about, and they might pop back for the Symposium on October 29th . You can read John’s article in full, below. 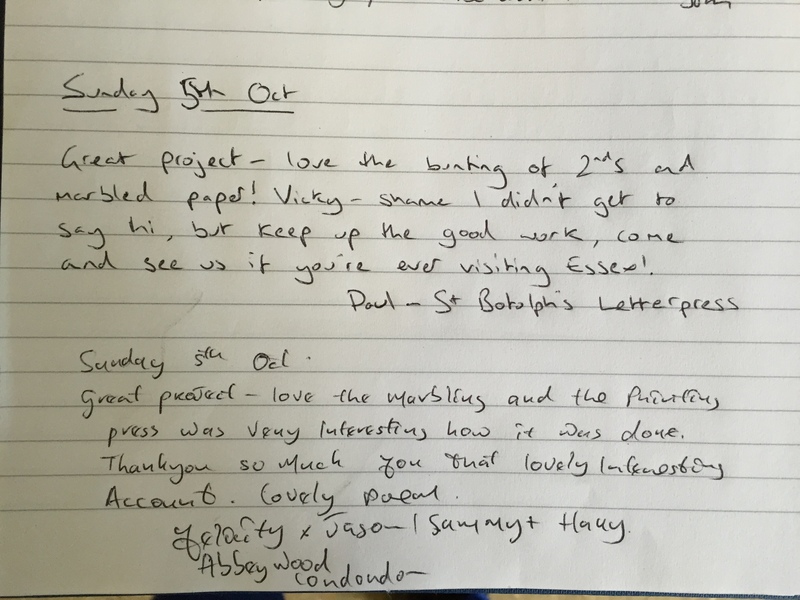 Part of our intention in running the Letterpress Reimagined project, has been to capture, collate and share stories from people who have been involved in the print trade for any or all of their lives. We’re aware that this is a sector which has undergone massive change in the past thirty years, and we don’t want these stories to be lost. We visited Amberley Museum a couple of weeks back, and stories from the volunteers there inspired and encouraged us. As well as sharing these stories, we’re interested in others, from anyone with a connection to letterpress or similar printing. -What encouraged or caused you to get involved with letterpress printing in the first place? –How would you say the craft / business has changed over the last 30 years? –What role would you say letterpress, and methods of traditional printing have in contemporary society? –What’s your favourite story / memory or occasion in your career (or time as a hobby printer)? –What would you say has been the saddest moment in your career (or time as a hobby printer)? –What one bit of advice would you like to pass on to anyone just starting out? -Anything else you’d like to share! You don’t have to give your name, though you can if you want, and the stories will appear on this site. We’d also be interested in any photos, drawings etc that you might want to contribute as well – perhaps a photo of you all smiling around a new press, or your first day as a compositor etc. Perhaps your log-book from your time as a printer’s apprentice. Anything like that, really! Please don’t worry about it ‘sounding right’ or needing to format things in any way. Just scrambled thoughts, a couple of sentences, or sketchy memories – anything at all will be gratefully received!! Please do also give us a shout if you have any thoughts or questions about the project as a whole! We spent some time at Sissinghurst Castle today, working on letterpress printing the inside front cover for the Sissinghurst poem booklet. Thanks to some excellent press-work from Carla and Ray, the one hundred prints were completed speedily and with enough time to stop and share with visitors to our open exhibition. While the printing was going on, I spent some time photographing a few of the most recent entries in our exhibition log book. 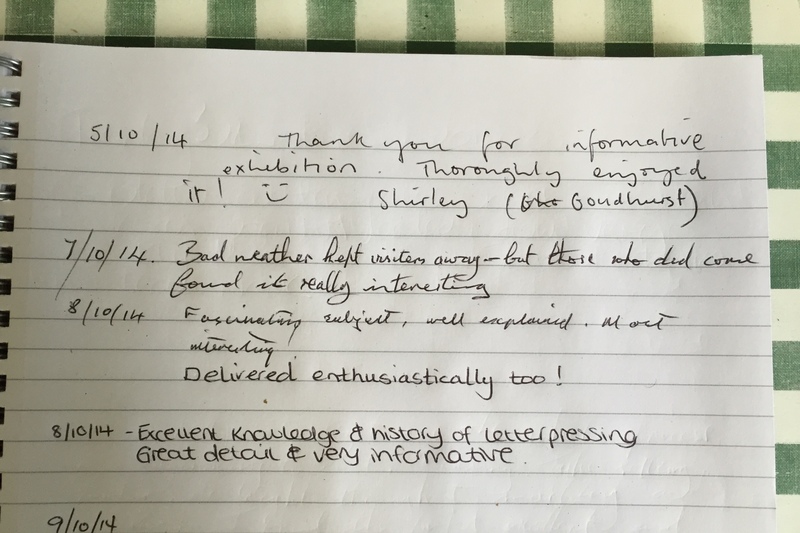 It looks like visitors to the exhibition have found it a positive experience. We’ve definitely had some amazing conversations – and heard some incredible stories – a few of which will be shared on this blog in the coming days.